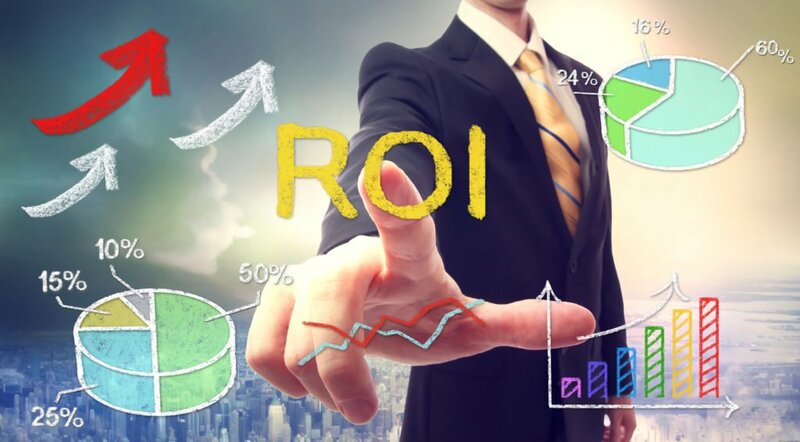 prioritizing spending in order to optimize results and ROI. Consistent with the times, phone calls and drop-ins are both becoming a thing of the past, and more and more conversions are coming from “non-traditional means,” including websites and mobile apps. New and prospective patients may spend two weeks or more, including multiple searches and website visits, looking for a physician or hospital provider, according to a highly informative report compiled by Google that helps illustrate just how powerful a role search and mobile technology now play in a patient’s decision-making process. Embrace the power of video: Mobile users exhibit a much higher demand for video (35%) than laptop and PC users (only 10%). So to round out your mobile site especially, don’t forget to include an engaging and informative video to help secure more of those all-important conversions. So what is most, high-quality, prospective patients searching for? 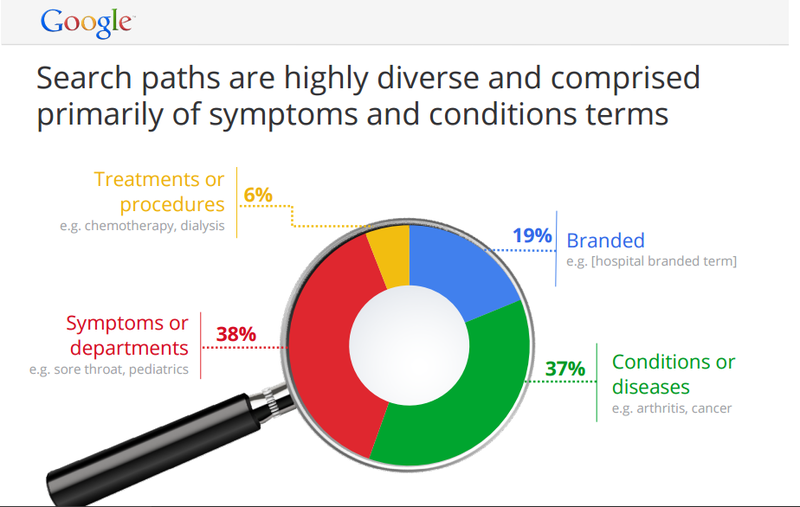 Well, consider this data, also from Google, which shows that an overwhelming majority—more than 80%—of patient searches include targeted medical and “non-branded” keywords. One of the most common misconceptions about SEO and paid search marketing is that to attract the most exposure and clicks, you should cast the widest net, targeting generalized keywords like “Doctor in Duluth,” “Family Dentists,” or even “branded” terms like the name of your hospital or practice. But to maximize ROI from SEO and paid search marketing, the aim is to appeal to the best patients, not necessarily the most. This suggests that to get noticed by the patients you want, when and where you want them, you must allocate a healthy portion of your SEO and paid search spending to “own” keywords like symptoms and medical specialties (e.g. a toothache, knee pain, cardiology), and conditions and diseases (arthritis, fibromyalgia, plantar fasciitis, etc.). And finally, one last item of advice would be to feature a clear call to action on all destination and content pages in an effort to capture prospective patient’s e-mail address and transform site visitors into qualified leads, or contacts, as is the power of inbound and digital marketing. That’s more than 4400% ROI, a level of return that no other tactic in the history of mainstream or digital marketing can touch. So how does e-mail marketing still perform so well given the estimated 121 e-mails that all of us, as consumers, receive every day? E-mail marketing, while certainly not the newest of all digital marketing tools, is still the most profitable…and in fact, it’s not even close. Marketers in other industries like retail have been known to derive $38 for every dollar spent on e-mail marketing activities, and for healthcare, it’s even higher: A staggering $44.25 (Source). Well, for marketers, e-mail is very inexpensive to send; new software and automation programs make it easy for marketers of any size to use; it’s checked frequently by patients on both PCs and mobile devices, so it gets seen; and it integrates well with other digital marketing tools like webinars and video, articles and special reports, and even in-person events. And for us e-mail recipients, while it’s true that we’re inundated with e-mail, we don’t hate receiving all of it; just the “junk” that we don’t care to read. Whenever our own health is the topic, though, and we stand to derive real health benefits from the information found in your e-mails, the majority are happy to hear from you. Medical Information: Current or prospective patients who visit your website for information on heart disease would likely appreciate if you sent them via e-mail, for example, related articles and/or video on how to reduce bad cholesterol, or a white paper explaining your recommended “heart-healthy” diet. When used wisely, e-mail is an excellent tool for educating and informing patients by way of valuable content that’s tailored specifically to their unique needs. Healthy Living Tips: Modern-day patients, and especially Baby Boomers, are committing to healthier lifestyles and see their physicians as active partners in ensuring their ongoing wellness. Periodic updates or even a monthly newsletter sent via e-mail and containing timely, health-related information and advice on everything from stretching and disease prevention, to facts about aging and healthcare, is seen as a consistent driver of value that’s in high demand among members of this audience. Reminders & Follow-up: Physicians and hospitals are beginning to use the power of e-mail to increase efficiency and provide better care and service to patients. Everything from appointment and payment reminders, to follow-up messages and patient surveys, are being delivered via e-mail, saving not only time and efforts of medical and office personnel but also shortening patient wait times and providing more attentive care.